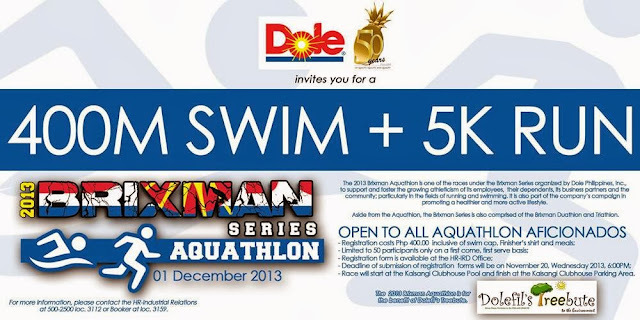 Join the first Dolefil 2013 Brixman Series: Aquathlon, a two-stage race involving swimming and running which is happening on December 1, 2013 at Dolefil Clubhouse Kalsangi in Polomolok, South Cotabato. 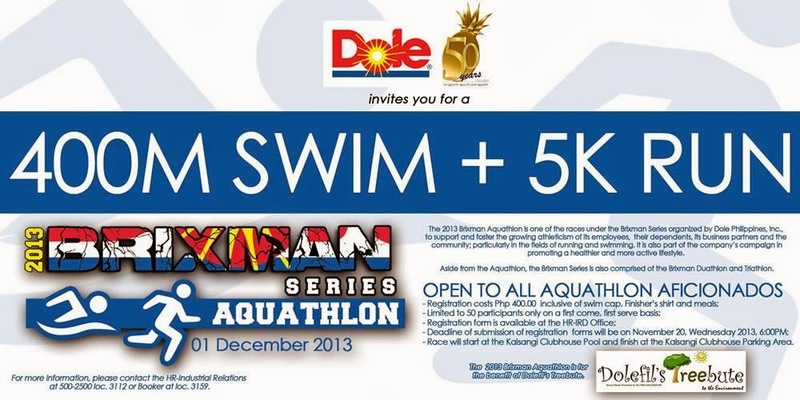 The Dolefil 2013 Brixman Series: Aquathlon is for the benefit of Dolefil's Treebute. It is open to Dolefil employees, dependents and business partners who are swimmers and runners. Registration fee is at P400.00. Deadline of submission of registration forms is at 6 PM today, November 20, 2013. Contact Dolefil at (083) 500 -2500 loc. 3112 or 3159 for inquiries.